Pinterest is a new social photo sharing with default integration with Twitter and Facebook. You can leverage your online presence with Pinterest with our tips. Time magazine has marked Pinterest among 50 Best Websites of 2011. With high SERP, definitely Pinterest is another great tool for designers, bloggers, photograhers, guide writers and product sellers. The best way to get in to Pinterest is to get an invitation. That is quite easy! Simply request us via comment using the real email address. We will send you the invitation, just like we did for Google Plus during the initial phase. As usually, we do not force anyone to Tweet, give a Facebook Like, click +1 button etc. Obviously any such action as thanks is much appreciated. This is how to get in to Pinterest. When I have registered via an invitation send by Corrine, I registered using Twitter. The system automatically added the data collected from my Twitter account. I created the new board named Cloud Computing, added a small description. Now, I copied one url of my copyrighted screenshot of one post and added it along with description. It has been now added to Pinterest as Pin. 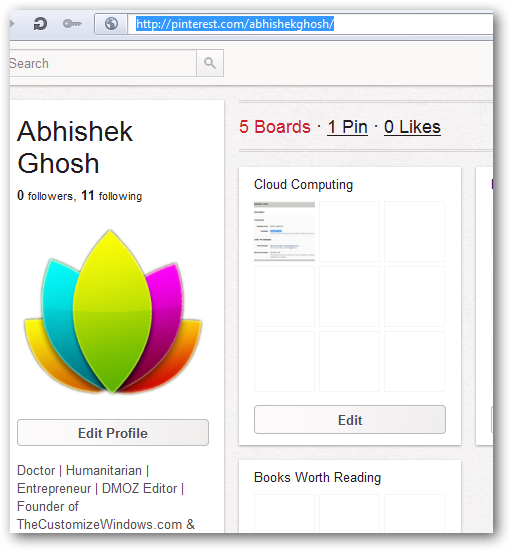 So, in Pinterest I am associating Cloud Computing, The Customize Windows and Abhishek Ghosh – these three elements in one place. Other than probable backlink, the search engines will find this association through Pinterest and there is a good chance of the image gets indexed rapidly. Additionally, as with any social media, the direct highlight and thereby chances of getting noticed is higher than not using any particular social media. It is important to plan your usage and targeting with Pinterest. Create properly named Boards. Add relevant images. Quite obviously you need to follow and needed to be followed by potential accounts. Update, follow, like on Pinterest regularly. This Article Has Been Shared 8834 Times! Cite this article as: Abhishek Ghosh, "Pinterest : How To Leverage Your Business Presence," in The Customize Windows, February 13, 2012, April 21, 2019, https://thecustomizewindows.com/2012/02/pinterest-how-to-leverage-your-business-presence/.